If you suffer from allergies, the chances are high that you want to avoid them at any cost. Allergies may be seasonal or affect you all year round, but the fact remains that they are uncomfortable, frustrating, and lower the quality of life. Plus, allergy treatment means costly medicine, which can cut into your savings or affect your insurance premiums. There are many people today who are looking for a way out of the vicious cycle of allergies. 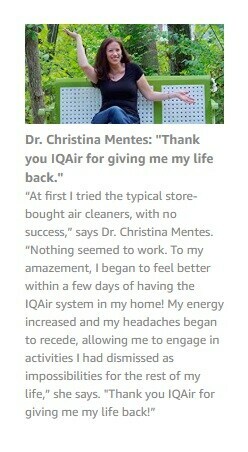 Luckily, many such individuals have found a lot of relief after they started using an air purifier. Around 50 million Americans currently suffer from some sort of allergies, and this number is only increasing as the years go by. In fact, 13.4 million visits to doctor’s offices and emergency rooms in hospitals have been due to some sort of allergic issue. It’s, hence, no surprise that the cost of treating allergies in the United States alone is over 8 billion dollars. Due to global warming, we have also seen the pollen season being extended by a full four weeks. If your allergies are seasonal, that means you have a month more to suffer through them every year. Even if they plague you all year round, allergies like hay fever are bound to become more aggressive during the pollen months. The good news about all these statistics is that there has been more research regarding technology to purify the air around us. Thus, there’s no need to think that this suffering would never end. Air purification technology has definitely promised allergy sufferers a lot of hope. There are now air purifiers that are especially geared toward ridding the air of allergy triggers, especially pollen. They may cost quite a bit, but they’re absolutely worth the investment. With devices like these specialized purifiers, you may be able to live in a home that’s free from allergens! This would lead to your feeling much healthier and more active than before. It would also cut down on the cost of taking expensive medication in the long term. If you’ve made the decision to buy an air purifier, simply snapping up the first one you see is not an option. You should carefully consider what’s on offer and what you require. Not every air purifier is the same, much like most other products. Below, you’ll be able to see the aspects of air purifiers you need to consider before making a final decision. True HEPA filters: These are used for trapping the small particles that could trigger allergies. Such allergens may include mold spores and pet dander. The filter would also ensure that these particles aren’t released back into your house or room. If the true HEPA filter is truly genuine, it would even capture particles that are 600 times smaller than a human hair. Dedicated pre-filters: These are instrumental in trapping the larger kinds of allergens such as dust particles, dust mites, and pollen. It also serves to protect the HEPA filter, thus indirectly enabling the capture of microscopic allergen particles as well. Be sure to choose an air purifier that has a whole separate dedicated pre-filter. This should be removable and washable in order to extend the life of the whole device. This would save on costs and ensure a high performance. When looking at room purifiers for allergies, you want a device that has a separate, dedicated pre-filter that can be washed and reused to extend the life of the product. This is also a highly cost-effective option. True HEPA filter air purifiers may be highly effective in absorbing the unwanted allergens from your air, but they do cost a pretty penny. A cheaper alternative to these is an ionic purifier, also known as an ionizer. It works by zapping the allergen particles instead of trapping them in a filter. While the zapping method may be effective in making allergens fall to the ground, it doesn’t eliminate the particles completely. If you do go for this more affordable option, you should make regular vacuuming a part of your routine. We’re all familiar with using activated carbon or charcoal in many products. When activated, charcoal is transformed into a highly dense substance. This means that it can absorb a whole lot of impurities inside itself. Since humans have used charcoal for filtering water and ridding the skin of impurities for centuries, there’s no reason why air filters can’t do the same. With charcoal acting as an air filter, you can look forward to a more natural and cleaner way of filtering. Like true HEPA filters, charcoal absorbs allergens instead of expelling them afterward. They can also be washed and reused up to a certain extent. In some cases, they may even be more durable than the HEPA option. 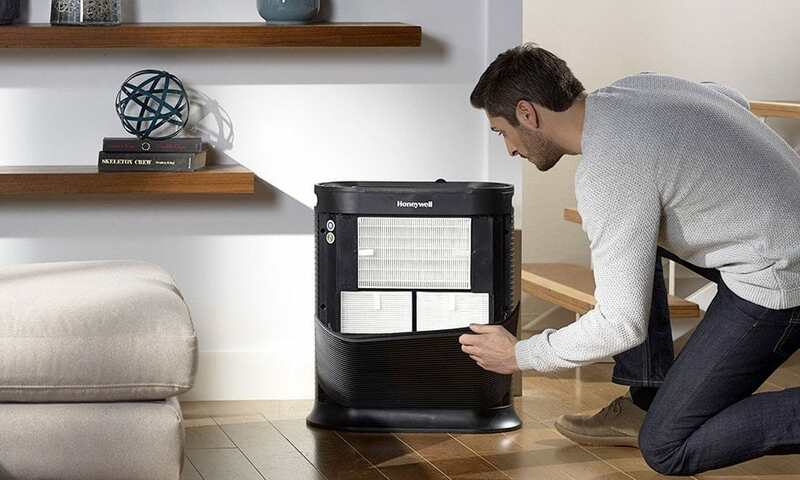 Now when you understand what to look for when buying an air purifier for allergies, you’ll know why we have chosen three products below as the best HEPA air purifiers for allergies you will ever find. 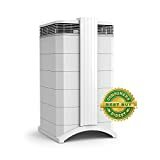 These air purifiers rank to top places in most of the reviews over the web between specialists and customers. These air purifiers deliver fantastic performance and all features needed to help with allergies. IQAir has specialized in large space air purifier market, they have a massive experience in this segment. 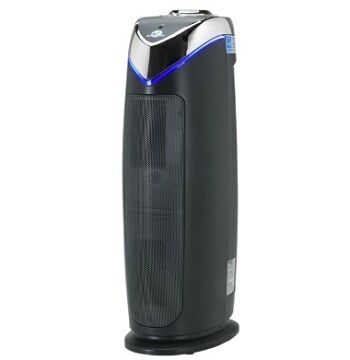 This allergy air purifier has a large pre-filter, gas and odor filter, HEPA filter and this combination capture 99.97% of airborne particles as small as 0.3 microns and 99.5% as small as 0.003 microns. That’s enough to purify almost anything – pollen, dust, pet dander, odors easily. This is one of the (or maybe it is) best air filter on the market. IQAir HealthPro Plus covers up to 1125 square feet (105 square meters) large areas. Use all 6 fan settings to make it perform quietly on first or second or fast (and pretty loud) on 5 or 6. Electronic controls make it easy to operate. It has all the necessary features and 5-year warranty. The only downside to this air purifier is expensive filters. They last various times depending on how dirty is the air and how often you use it. But here is our tip. Put the prefilter screen on the bottom at the air intake. That will double the life of the actual pre-filter. Then just change the filter screen and reset the pre-filter timer. Read our full and detailed review about this air machine here. 9 times out of 10 allergist physicians recommend Honeywell products as a best for allergies. Honeywell True HEPA HPA300 is number one from Honeywell. It has odor reducing pre-filter, true HEPA filter, and this combination captures 99.97% of airborne particles as small as 0.3 microns and larger. Approved for large spaces up to 465 square feet (43 square meters), it has 4 air purification levels, it’s equipped with powerful filters and other excellent features making it really great air purifier. 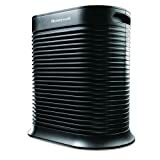 Honeywell HPA30 air purifier is one of the quietest between all Honeywell air purifiers but doesn’t expect it to be quiet on largest fan speed. To make it work smoothly you will have to replace pre-filter regularly – every 2-3 months – when the light comes on. If you suffer from allergies I recommend change it every 6 weeks. And here is the good thing about it – it’s cheap. True-HEPA filter needs to be replaced once a year and it’s price also is acceptable. Alen BreatheSmart is an Amazon bestseller. It has a washable pre-filter, HEPA-pure filter (You can choose also between HEPA-silver, HEPA-OdorCell, HEPA-FreshPlus) and ionizer. It removes 99% of particles greater than 0.3 microns. Whatever of HEPA filters you choose, they will work for allergies. Alen BreatheSmart can cover up to up to 1,100 sq ft giving you fresh, purified air in under 2 hours. This air purifier gives not only great performance, it is also a great design element to your room because of the beautiful design with customizable designer panels. Alen BreatheSmart has all technologies that can be installed in an air purifier. The best is Auto Mode that intelligently adapts its purifying power to produce the best air quality at the same time maximizing filter life and saving energy and money. -Have to choose between filters. Can’t combine them together. Rabbit Air MinusA2 SPA-780A has a pre-filter, medium filter, BioGS HEPA filter, customized filter, carbon filter, negative ion generator, it removes 99% of particles greater than 0.3 microns. The customized filter can be used as a germ, pet, toxin or odor remover. This multiple filters set system will trap everything making it perfect for allergy sufferers. The machine works smoothly in spaces up to 815 sq.ft large. The air purifier has a great design with customizable designs. For example, artists series include Claude Monet, Vincent Van Gogh, and others. Another awesome thing is that it can be mounted on the wall. After looking at the options mentioned above, it is clear that true HEPA and activated charcoal air filters are really the best options for purifying the air around you. These would make sure that the allergens being absorbed would not find their way into the room again. With the ionizer option, there would always be the fear of someone inhaling the allergens from the ground. If those dangerous particles got sucked up by the carpet after being zapped, they could also prove harmful for a young child or pet. Hence, it’s recommended that you look for a true HEPA or activated charcoal option for your air filter. The quality and amount of charcoal used should be high, so be careful when making a purchase! 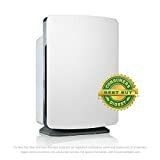 Posted in Air Purifier Reviews, Air Purifiers, BLOG, Reviews and tagged Air Purifier, Air Purifier review, Allergies, best air purifiers, Best Air Purifiers for allergies, Indoor Air Quality.